The IAU has recently launched its list of IAU-accredited Outstanding Astronomical Heritage (OAH) sites, which are available on the portal. We have recently introduced movable object case studies and just published a new one: the Nebra Sky Disc. 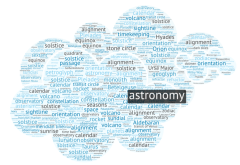 Welcome to the integrated web portal for UNESCO’s Astronomy and World Heritage Initiative, supported by the International Working Group on Astronomy and World Heritage and by the International Astronomical Union through its Commission C4 on World Heritage and Astronomy. The Portal to the Heritage of Astronomy exists to raise awareness of the importance of astronomical heritage worldwide and to facilitate efforts to identify, protect and preserve such heritage for the benefit of humankind, both now and in the future. Participate in our global community project PC2S, which is part of the IAU’s “100 Years: Under One Sky” celebration! 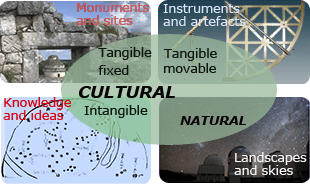 Cultural heritage related to the sky is a vital component of cultural heritage in general. What is the purpose of this web portal? This portal supports UNESCO’s Astronomy and World Heritage Initiative (AWHI) through the provision of thematic essays, case studies and general information, for example on preparing a nomination dossier for the World Heritage List. We encourage professional users to register and login in order to view detailed information, propose a new case study or suggest changes to an existing one. Click on the different parts of this diagram to find out more about a certain category of astronomical heritage. See our Dark Skies Information page for further information about International Dark Sky Reserves, Starlight Reserves, and other Dark Sky Places. You can locate case studies of interest both geographically and temporally using our astronomical heritage finder, or browse a complete list. You could also start from one of our Thematic Essays.